Would it surprise you to learn that the Nazis had a conscience? It shouldn’t. Most people do. The murderers who shoot abortion doctors have a conscience – a mis-aimed one, but in their minds, they’re heroes saving babies. They are heroes, and we are monsters. This is important to understand. Even people on the wrong side believe they are right. Although it may be repugnant to conceive of mass murderers acting in accordance with an ethos that they believed vindicated their crimes, the historical record of the Third Reich suggests that indeed this was often the case. Abortion clinic bombers, protestors, and murderers believe they are opposing a terrible moral wrong. They’re protecting innocent lives. Nazis believed they were protecting their ethnic community from corrupting influences. Not all of them, of course: some of the people at the top are really just in it for themselves. Some of the people involved follow along because they were told it’s the right thing to do, and they didn’t question their authorities too much. We’ll see that as we proceed through this book. We’ll recognize people and communities we know, disturbingly reflected in the ordinary Germans, in the Nazi party faithful, in the leadership and in the followers. Our civilizations have always contained people we don’t consider people. In our vaunted Constitution, we even enshrined that thinking into the foundation of our law: slaves were a mere three-fifths of an actual person, and then only to give more power to their (fully) human owners. We demonize criminals, addicts, and sexual deviants even today. So we shouldn’t be so certain that the atrocities of the Third Reich couldn’t be committed here. We already other the humans we find distasteful. We, too, could be easily persuaded there’s only one solution. And we could be made to believe it’s the morally right one. In order to accept and help cause suffering and death on a massive scale, we would only have to be persuaded it’s all for a greater good. 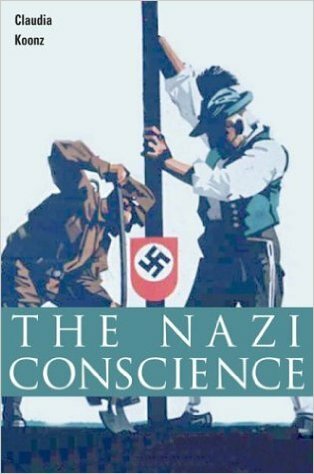 We’re studying The Nazi Conscience as a way to prepare for what’s happening now. If you want to read along, you can pick up an inexpensive used copy at Amazon. Buying through that link also supports my blogging, so thank you!